They can fly further from your controller and give you a wider field of view. They can get higher to give you those perfect aerial shots. Today, there are civilian drones that can go up to 7KM (4.3 miles) away from the owner and the controller yet still remain in range to offer excellent control. In this list, we have compiled reviews for the 5 best long range drones for 2018. 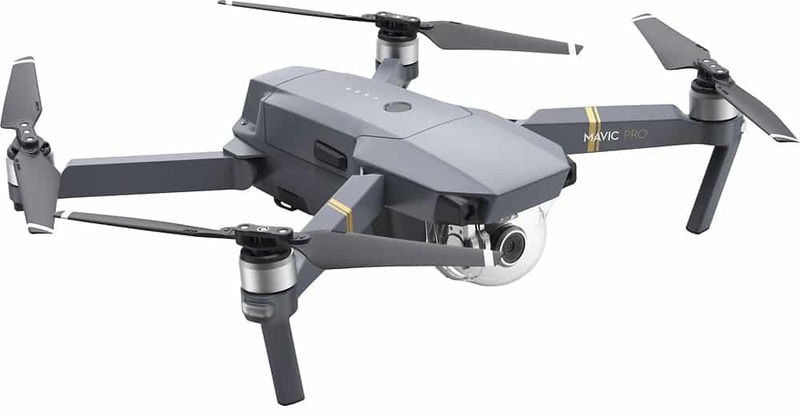 The DJI Mavic Pro gets a spot on this list because it has some incredibly impressive features including a maximum flight range of 7KM (4.3 miles). Apart from the long-range flight distance, this AUV is also very easy to control. Although to those who have excessively large hands, the controller might seem small, it fits just perfectly with most hands. The drone can stay airborne for about 27 minutes and can travel at around 40 mph. It also has a fast battery recharging time (60 minutes) and comes equipped with an impressive 4K camera and five vision sensors plus image stabilization. The controller is a little too small. Small and has a limited payload. For something so portable and so powerful, it is easy to control and offers you immense value for the money. The Yuneec Typhoon H Pro can fly reasonably well to a distance of about 1.6 KM (1 mile). Because it is very affordable and comes with collision avoidance feature, this has to be one of the best long range drones on the market for its price. It is very compact and highly portable. It has improved flight stability which makes it a joy to fly. It can also offer you the virtual reality option of First Person Viewing (FPV) that takes your drone flying experience to unbelievable heights – but at an extra cost. The controller has a large-sized 7″ touchscreen display as well as an HD 720p video downlink. Perfect for taking advanced aerial photography and videography, this drone comes with a gimbal image stabilizer and can offer you impressive panoramic shots. As a hexacopter drone, the most outstanding feature of the DJI Matrice 600 (M600) is that it is a heavy lifter. Which means that it gives you more options when it comes to whatever camera you want to put up in the sky. With a maximum flight range of 5 KM (3.1 miles), a top speed of up to 40 mph and flight times of up to 35 minutes, this is the workhorse of drones. The necessary add-ons increase the cost further. With the ability to carry a payload of up 13.2 pounds, you have a wide range of options when it comes to cameras and filmmaking accessories with this drone. It is by far one of the most flexible and useful long range drones on this list. Dubbed as an ‘ultra-smart flying camera,’ the DJI Phantom 4 Pro is marketed to professional drone pilots, but even an advanced beginner will find this copter very workable. With a flight distance range of 7 KM (4.3 miles), this drone has an impressive flight time of 30 minutes and can go at a speed of 4 mph. The remote controller has a 5.5″ screen and is twice as bright as most smart devices which makes it perfect for sunny day flights. It comes with the DJI GO app that allows you to edit and share footage instantly. It also gives you the option of experiencing First Person View (FPV) flights with the FPV Goggles which are exceptionally comfortable despite their awkward look. You need to use a smartphone or a tablet to control the camera. Coming fully loaded with an excellent onboard camera with a 1″, 20MP compressor that offers no shutter distortion as well as 4K video processing, this quality drone is almost as good as most on the ground professional cameras. This long range drone is perhaps the most exciting on this list because you can fully customize it to become your desired UAV of choice. These long range drones are perfect for those who want to take their flying game to a whole new height and distance. You can use them as part of your filmmaking equipment or just for your personal enjoyment. With flight times of up to 40 minutes for some and quick battery recharge times, that is a lot of enjoyment. Selfie Drones: Who Needs Selfie Sticks When You’ve Got Drones?